1. Bell peppers are low in calories! So, even if you eat one full cup of them, you get just about 45 calories. Bonus: that one cup will give you more than your daily quota of Vitamin A and C! 2. They contain plenty of vitamin C, which powers up your immune system and keeps skin youthful. The highest amount of Vitamin C in a bell pepper is concentrated in the red variety. 3. Red bell peppers contain several phytochemicals and carotenoids, particularly beta-carotene, which lavish you with antioxidant and anti-inflammatory benefits. 4. The capsaicin in bell peppers has multiple health benefits. Studies show that it reduces ‘bad’ cholesterol, controls diabetes, brings relief from pain and eases inflammation. 5. If cooked for a short period on low heat, bell peppers retain most of their sweet, almost fruity flavor and flavonoid content, which is a powerful nutrient. 6. The sulfur content in bell peppers makes them play a protective role in certain types of cancers. 7. The bell pepper is a good source of Vitamin E, which is known to play a key role in keeping skin and hair looking youthful. 8. Bell peppers also contain vitamin B6, which is essential for the health of the nervous system and helps renew cells. 9. 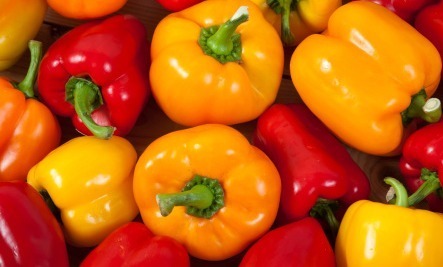 Certain enzymes in bell peppers, such as lutein, protect the eyes from cataracts and macular degeneration later in life. Topical capsaicin is used to alleviate pain caused by for osteoarthritis and diabetic neuropathy. It works by desensitizing sensory receptors, and also possesses anti-inflammatory effects. Spicing up your meals with hot peppers is an excellent first step in preventing atherosclerosis.